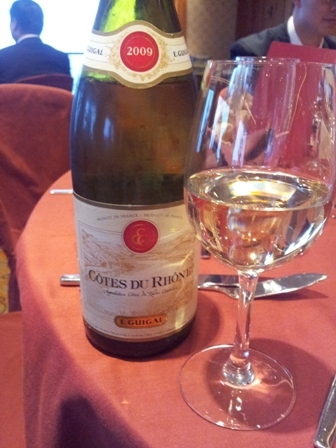 At a recent dinner function I had the opportunity to taste some wines by Etienne Guigal, the famous wine producer from Côtes du Rhône, founded in 1946 and today managed by the third generation. Marcel and his son Philippe are producing excellent wines. In 1995 the estate acquired the famous Château d’Ampuis, which has become the headquarters of the Guigal Estate. The Guigal family owns vineyards in Condrieu (about 150 ha) and the Côte-Rôtie (230 ha). So this is not a small family business. In Condrieu the jewel of ths estate is “La Dorianne”, a Viognier. In the Côte-Rôtie area the Guigal Estate has several jewels, for instance “La Mouline”, “La Turque” and “La Landonne” among others. The ‘2009 Côtes-du-Rhône White’ is a bled of 55% Viognier, 20% Roussanne, 10% Clairette, 10% Marsanne, 5% Bourboulenc with aromas of white peach and apricots. It was full and round, almost a bit fat. To say it from the outset, I liked the red much better than the white. It might have to do with the food it was paired (I did not like the food) but somehow I did not find a way to this wine. The red was a different story. I would have served it a bit cooler but I just loved it. 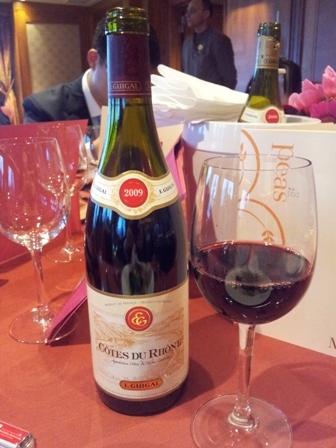 The ‘2009 Côtes-du-Rhône Red’ is a blend made from 45% Syrah, 52% Grenache, 3% Mourvèdre. The intense aromas of red berries, the smoothness of the tannins and the long finish, are something I treasured in this wine. Again it did not match the food (chicken), but it reminded me of similar blends from Southern Australia which I like very much. This is an elegant wine and I highly recommend it. It is an excellent specimen of a red blend the Côtes du Rhône has to offer. You are currently browsing the The Man from Mosel River blog archives for the day Thursday, May 31st, 2012.